In 1935, an insect like small beans of about 3cm was discovered by Mr. Sasaki, a teacher of Ali junior high school. It is called Cissites cephalotas. The common Japanese name is Hirazugensei. It means Gensei of flat head. But this insect was discovered in Kochi at first, so often it is called Tosahirazugensei and is the Prefectural Representative Insect of Kochi. Length is about 3 cm. 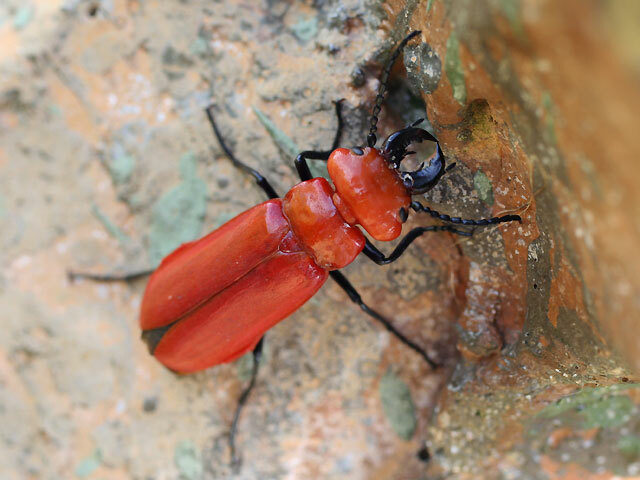 Color of the body is vivid red, six legs and big jaw is black. Male jaw is large and powerful looking, but female jaw is small. As mentioned above, at 1935 it was first observed in Kochi. Later Dr.Kawano who was professor in Hokkaido university, named the male Sasakihirazugensei, named the female Tosahirazugensei. In other words, he thought that the different sexes were two different species. But at present these two species are one species, this fact is established. Also later there are records in Inoguchi, Kawakita, Ibiki etc. in Aki city. This is included of family Meloidae. In this family there are more 10 species for example Kirogensei etc･･･. It is certain thing which the rare insect is collected in Aki city. So this insect is a souvenir insect as Kochi. Hirazugensei live in Honsyu,Shikoku,Kyusyu district of japan, the Philippines, Taiwan, Vietnam, Myanmar, Malaysia and Indonesia, and it is found in forest mountain (low~middle level) etc. Especially, this insect lives around nests (beats) on the plains. It is known that Hrazugensei has a relationship with a certain beetle (Kumabachi). Larva of Hirazugensei grows in nest of Kumabachi. Adult comes out from nets of Kumabachia from June to July. But it is unknown how the larva invades the nests, or what food the larva eat to grow. Therefore the appearance in nests is not known. There are unknown points about Hiratagensei. The cause of this is that Hiratagensei is rare insect. (Appointed associate endangered species in Kochi) But a lover of insects in Kochi wish that they understand myself about ecology of Hiratagensei which is recorded at first in Kochi. Hirazugensei live around the nests of animals in the plains. So searcher should search nest of Kumabachi (it could be found in temples, old house, a house made of wood) at first, next look nests below. Many Japanese children enjoy collecting insects. However, as they get older, people often lose interest in insects. This interesting discovery can make people interested again at any age. If you are lucky, you can find HIrazugensei.Lets come back to curiosity. I did not this living thinng.But i knew this living thing.So,I am thankful to you. I want to continue having intellectual curiosity through insect-collecting. I did’t know this insect. it is very iteresting. Iwant to see this insect.